College Park, MD -- Researchers have devised a means of dramatically increasing the fidelity of key quantum measurements in diamond crystal, a development that could lead to the creation of high-resolution magnetic sensors and to powerful new techniques for quantum computation. The work,* by scientists at Harvard, JQI, Texas A&M, and MIT, including JQI Fellow Jake Taylor, involves a commonly occurring but extraordinarily useful defect found in diamond, known as a nitrogen-vacancy (NV) center. Perfect diamond consists of a famously rigid lattice of carbon atoms. But sometimes an impurity occurs in which an atom of nitrogen (carbon's immediate neighbor on the periodic table) takes the place of one carbon atom. That substitution creates a tiny region in the lattice that energetically favors the presence of a "vacancy" - the absence of one carbon atom. 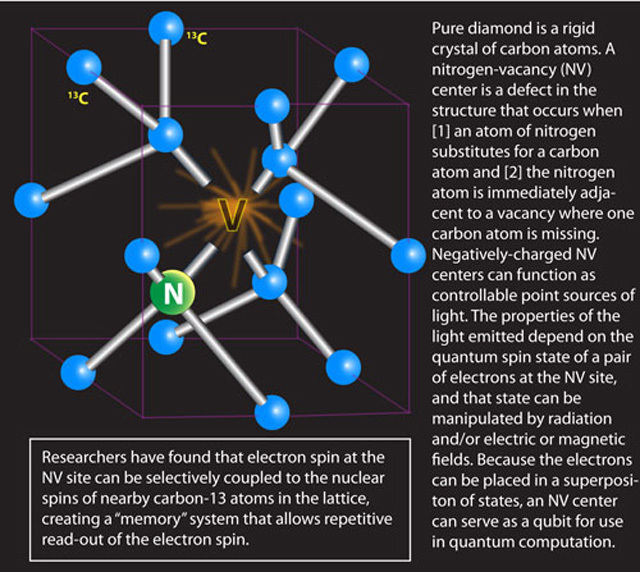 The combined nitrogen atom and its adjacent vacancy make up the NV center. These centers are of intense interest to quantum science because of their peculiar optical characteristics. When excited by light, electrons in the NV center fluoresce strongly, helping give diamond its "sparkle." More importantly, the wavelength and intensity of the emitted photons can vary substantially depending on the spin state of the electrons; and that state, in turn, depends critically on the presence of magnetic or electric fields, or on electromagnetic radiation applied to the site. This phenomenon makes NV centers exquisitely sensitive detectors of magnetic fields on a nanometer scale. "The spin-dependent fluorescence of NV centers allows us to measure the local magnetic field, which gives unprecedented spatial resolution and high sensitivity, including the measurement of individual nuclear spins," says Taylor, who is now at the National Institute of Standards and Technology. "That is a crucial tool for understanding molecular dynamics and of particular interest in biological systems." In addition, the electrons in NV centers have two advantages that make them ideal for use as qubits - the quantum equivalent of the "bits" in conventional computers. They retain their spin states for comparatively long time spans, and the states can be manipulated rapidly by microwave radiation. Once the electron spins are placed in any desired state, they are irradiated by green laser light, and the nature of the emitted photons reveals the electron state. However, there is a major problem in taking repeated measurements: The laser light frequently "resets" the electron states before photons can be measured. As a result, there is large uncertainty in the electron spin state. The scientists, who publish their results in the Sept. 10 on-line advance publication site of the journal Science (Science Express) were able to circumvent this problem by using microwave pulses to couple the electron spins to the nuclear spin of a nearby carbon-13 atom. The nuclear spin state is not affected by the 532 nm laser beam that is used to read out the electron spin state, and so it serves as a sort of memory device. Of course, even this relatively long-persisting nuclear information will ultimately fade as the nucleus reverts to its ground state. So the team went one step further, linking the13C nuclear spin to that of a yet another carbon-13 atom in the vicinity. This coupling is equivalent to the action of switches or "gates" in electronic logic circuits whereby each gate performs a specific operation on a unit of information. If the configuration is right, one can work backwards from the final state of the information to recover its original state. The corresponding linking of two atomic spins in diamond thus provides added memory stability by making the first atom's state recoverable by examining the second. "With ideas from quantum information science, we are able to improve the collection of light by mapping the electron spin information into nuclear spin, then using the nuclear spin as a 'control' bit on the electron spin, and measuring the electron spin many times," Taylor says. "Moreover, this example of a small quantum circuit also displays the potential for NV centers to serve as the basis for a room-temperature quantum computing device. In particular, by demonstrating good control and measurement of three quantum bits - that is, the electron state and two nuclear states - we have gotten much closer to the 'single-shot' read-out regime. At that point, we will eventually be able to deterministically measure a single electron spin, using the light emitted by the NV center."